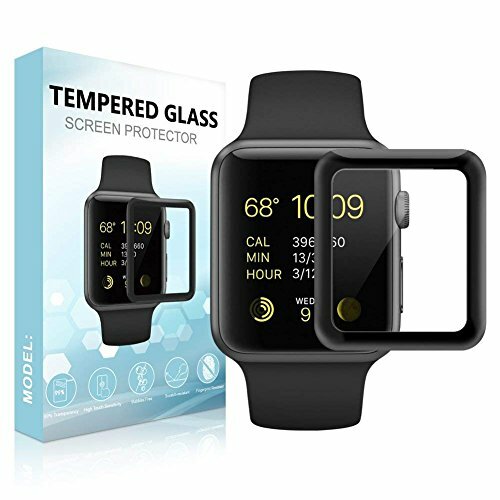 [3D Full Coverage] Designed with black frame around the edges, this tempered glass screen protector can exactly matches the contour and fully covers the corners and curved edges of your Apple Watch, providing edge-to-edge protection. [Top Grade Protection] 9H hardness can effectively protector your Apple Watch against drops, bumps, scratches and daily wear and tear. [Optically Transparent] 99% HD Clear protector with premium tempered glass surface keeps the bright and colorful image quality, smooth to touch and keeps your device fully responsive. [Automatic Adsorption] Automatic adsorption technique and full adhesion allow for easy installation. This protector will absorb and attach your Apple Watch screen automatically, stick snugly without compromising your touch screen feeling. [Compatible with Series 2 & 3] Please note that this screen protector fit for Apple Watch Series 2 or Series 3 42mm, not for Series 1.